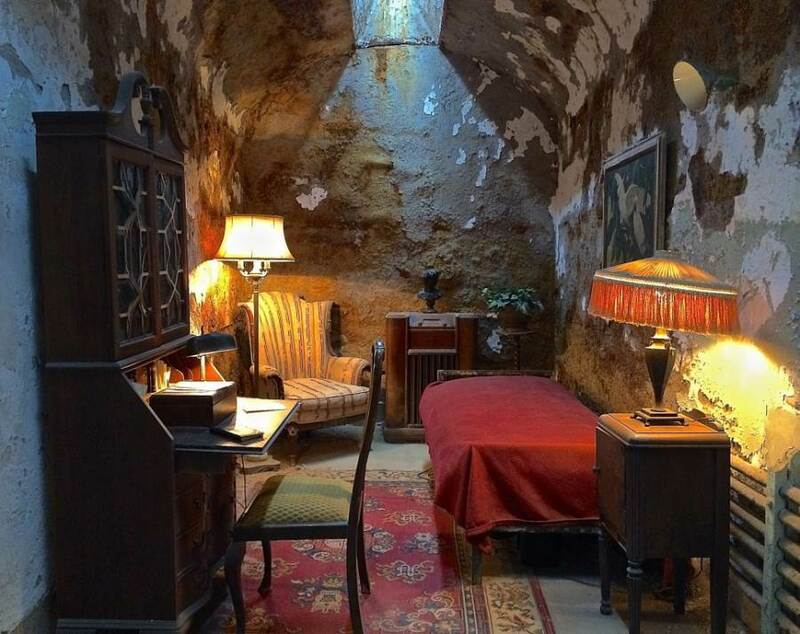 Featured above is Al Capone’s prison cell at the now-closed Eastern State Penitentiary in Philadelphia, Pennsylvania. Capone spent nine months of his life there starting in May 1929, after he was convicted of carrying a concealed, deadly weapon. An August 1929 issue of the Public Ledger implied that Capone received special status in his oriental rug and armchair-filled cell, but to this day ESP challenges that claim. According to ESP reports and news articles of the time, Capone was “accorded no more privileges or recognition than any other prisoner” and “had no better quarters than scores of other men…regular cells may be decorated and furnished by the prisoners with the few luxuries obtainable at the prison store.” Believe it or not, those at ESP said that Capone was a “model inmate” who worked hard at his assigned jobs and read a number of good books, including a biography of Napoleon Bonaparte. Capone’s motivations for doing things like this aren’t entirely certain, but many would later look to Capone as a modern-day Robin Hood (after all, he did start his own Chicago soup kitchen during the Great Depression), which aided in increasing his popularity among those struggling–and stoking their resentment of officials who tried to put Capone back in the slammer. On March 16, 1930, Capone was transferred to Graterford, where he was released a day later. Over the next decade, Capone would be in a near constant state of imprisonment.